Some of the best experiences pop up spontaneously. These days it's more difficult to be spontaneous with family and work, but I am still ready for anything as much as I possibly can be. 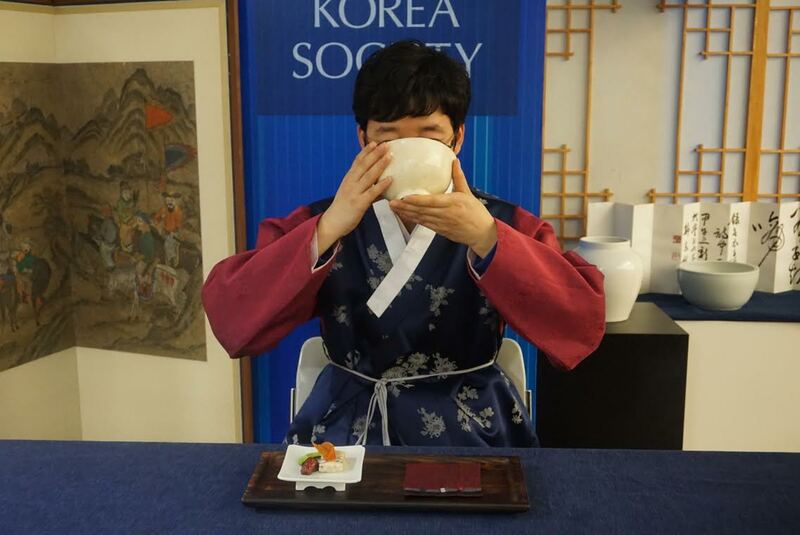 When Jee asked if I wanted to attend a Korean Tea seminar at the Korea Society, I knew I couldn't say no. 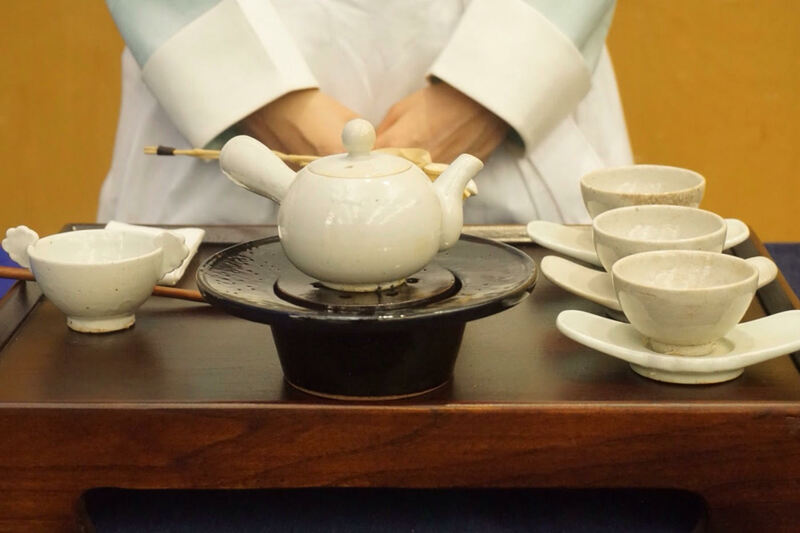 I don't know much at all about Korean tea, and knew this would be a special opportunity to learn more. Knowledgeable representatives from the Hagajae Museum in Korean flew up just for this special event. 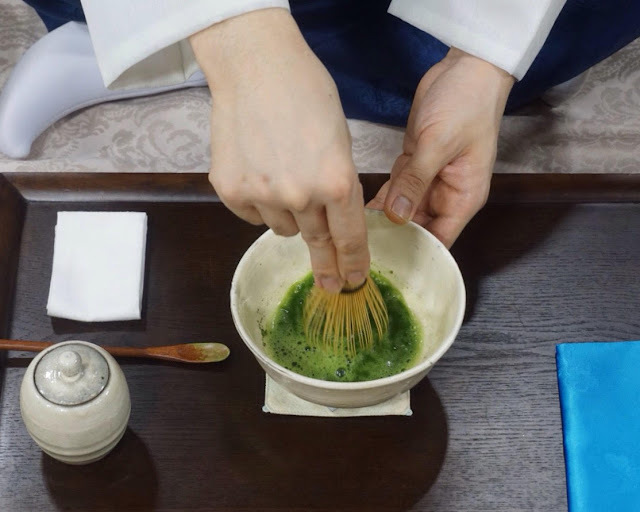 We had the unique opportunity to try a Korean green tea, learn about the Korean tea ceremony and how it differs from the Japanese and Chinese styles, and also sample matcha with Korean snacks. When we first arrived we were given cups of green tea served in a side-handled teapot prepared and served to us with intention and fluidity. I asked about the tea and was told it was wild grown in Handong and not farmed . I actually had a chance to try my hand at preparing the loose green tea by following the gestures of one of the tea experts. It was fun to get hands-on, but I was quite nervous since I have the true nature of a klutz. Note, this is preparation of loose leaf tea, not the ceremonial matcha preparation. 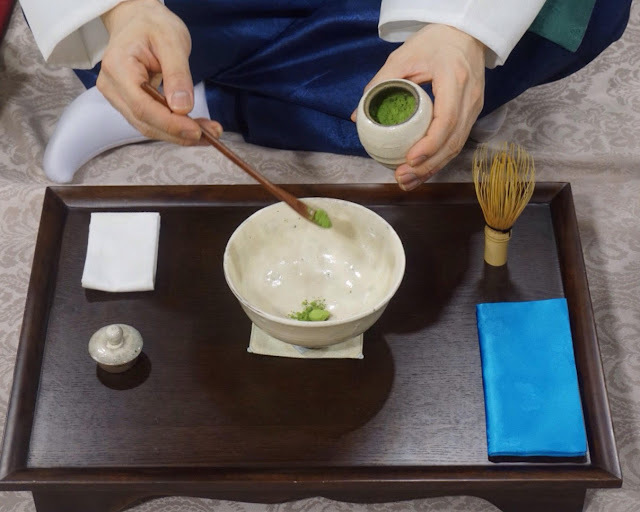 You can learn a little bit about how to traditionally prepare a pot of Korean green tea here. 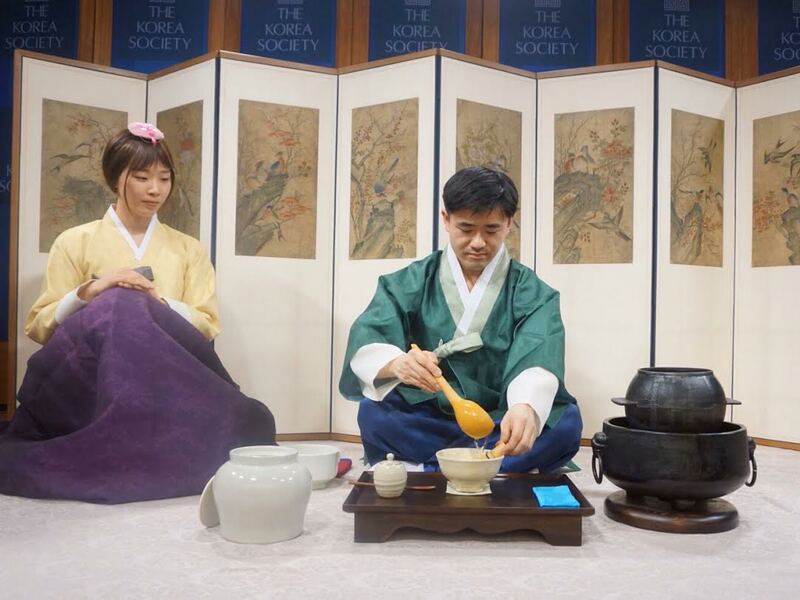 The knowledgeable Dr. Roy Ghim, president of the the Hagajae Museum led an interesting discussion about Korean Tea. A good amount of time was spent differentiating between Chinese, Korean, and Japanese style and how this is reflected in the tea ceremony. We learned the Chinese style is more flamboyant, with flourishes not seen in the other two cultures. The Japanese aesthetic is much more minimal and precise. Korean style seems to be in-between with a focus on nature and poetry. We were shown photographs of the different tea houses and it was helpful visually see how they are similar yet very different. We were then treated to a Korean tea ceremony. It is very similar to the Japanese tea ceremony in equipment, grace, and extreme focus. It's beautifully controlled choreography. It did feel a bit different though, a little more fluid and less rigid. From start to finish, reverence is paid to the tea, and gratitude shown to the individuals preparing and sipping the tea. The service was quite meditative to watch. It's hard to explain every step and I was more interested in observing than taking notes. Jee and I had the opportunity to take photographs the next day, so I hope the pictures will help give you an idea of how the ceremony looks. I also just noticed that The Korea Society posted a video of the entire night right here. It is a lengthy video but I encourage you to at least watch a little bit. When you are served a bowl of tea you are supposed to finish it in three sips. I thought this was interesting, as it basically forces you to really savor and think about the tea if you only have three sips to enjoy it. We were given a few Korean snacks to enjoy with our tea. They all paired well with the vegetal, sweet matcha. 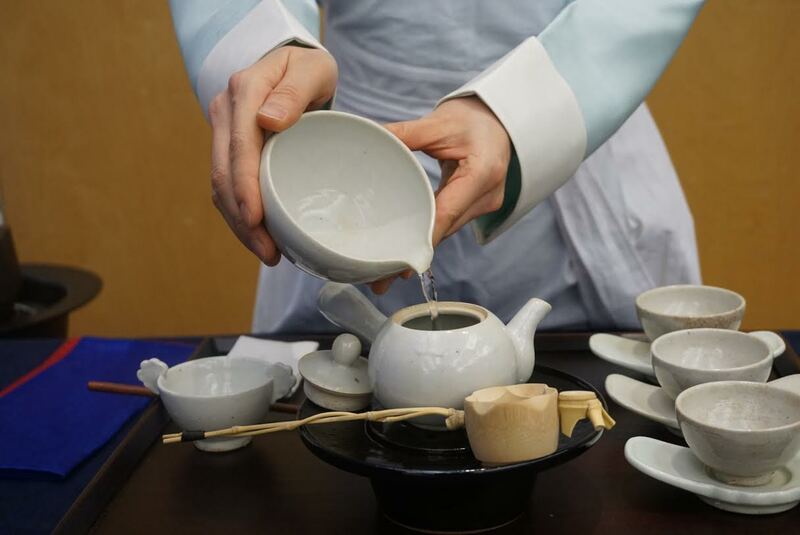 This evening of tea and education opened my mind to the world of Korean tea. I'm eager to learn more about it and try a few more teas. I've only had a handful of Korean grown teas, mostly delicate greens and a delicious black tea called Jukro that has notes of burnt brownie and vanilla. If anyone has a Korean tea they love, please recommend it! Sara, great job with this post! Your photo series and descrption makes me feel as if I attended the ceremony. The Jukro from PdT is so good, right?! I enjoyed a Jeju Island green tea a few years ago which Mr. Tea brought back from Korea. Very cool! I've never seen the full Korean ceremony before. So glad you enjoyed reading it, Simone! 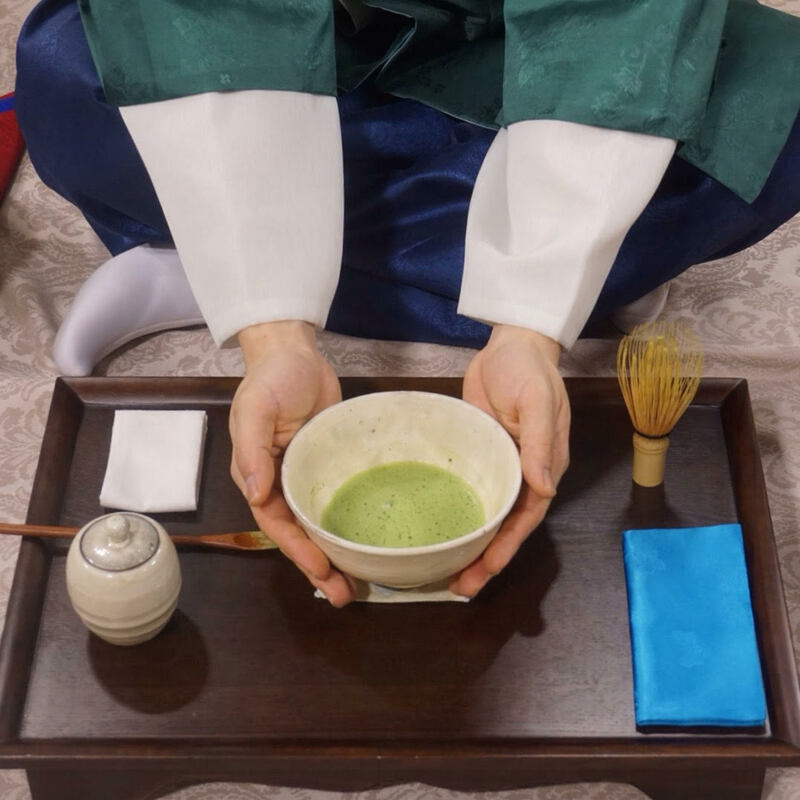 I seems like you also given us the significance of Korean Tea ceremony. 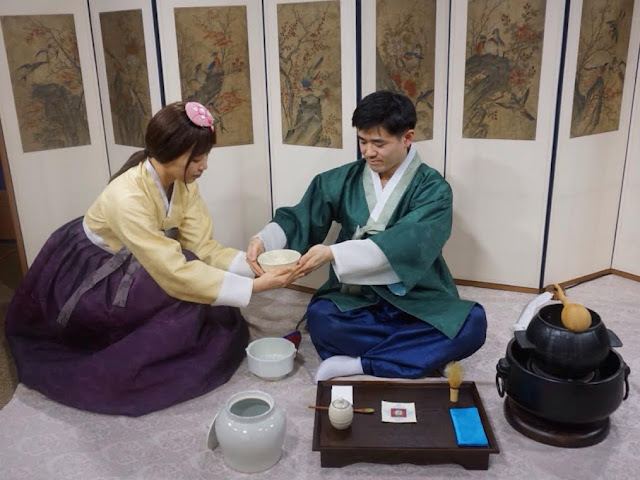 I love seeing the differences between Korean tea ceremonies and other cultures. Up till now I have never seen a matcha ceremony from Korea. Do you know why they use a blue cloth by any chance? Good question Katherine. I'm not sure why it's blue, but I can try and find out. 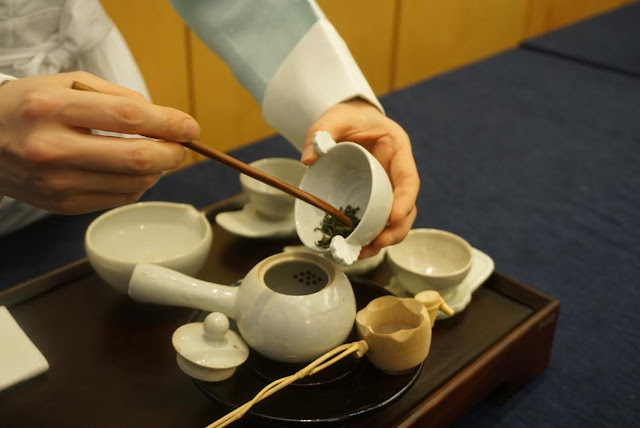 It is nice to know more about Korean tea culture. Thanks for sharing. Thank you Albert! I'm glad you enjoyed it. It looks like the Japanese tea ceremony. 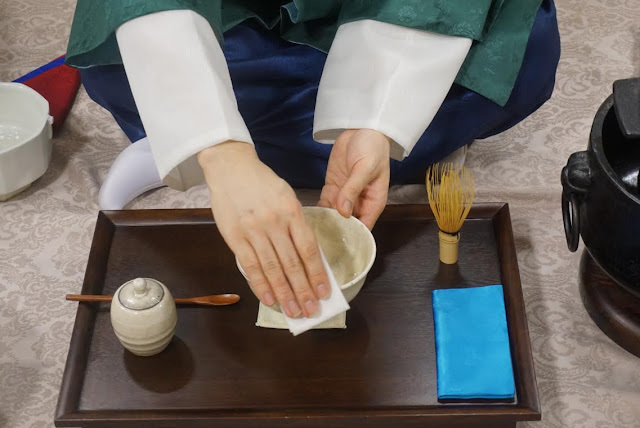 It is my knowledge that Korea doens't have a tea ceremony culture like China and Japan do.